We work in partnership with our supporters to ensure that anyone in our city can participate and progress in the visual arts. From children exploring their newfound talents and interests, to professional artists experimenting with new ideas—we believe everyone of all ages, backgrounds and skill levels deserve the opportunity to develop creatively. Our success is made possible by people like you! Every autumn, Hyde Park Art Center celebrates another year of advancing Chicago art and artists with our Annual Gala. In addition to highlighting our arts education, exhibition, and residency programs, the Gala honors distinct contributors to visual art and civic life in Chicago. Hyde Park Art Center works in partnership with its supporters to ensure that anyone in our city can participate and progress in the visual arts. 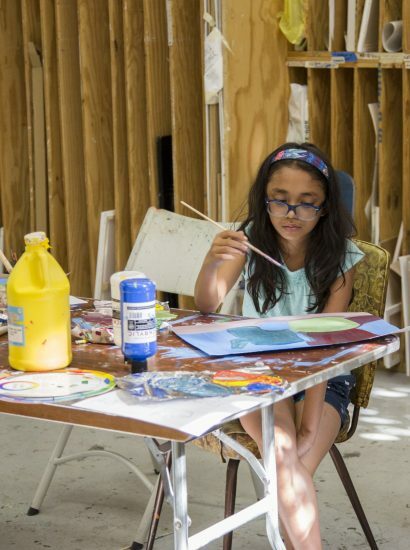 From children exploring their newfound talents and interests, to professional artists experimenting with new ideas—the Art Center provides a space for everyone to develop creatively and amplify their skills. The Visionary Leaders’ Circle is Hyde Park Art Center’s legacy society. Members of the Visionary Leaders’ Circle have the foresight and generosity to support Chicago art and artists by making planned gift in the years to come to the Art Center. Hyde Park Art Center’s advocate groups provide an opportunity to deepen your support of the Art Center. Artist Advocates and Education Advocates help increase visibility for our artists and students, while securing the future for arts in Chicago, with annual membership of $2,500 or more. Artist Advocates and Education Advocates also receive exclusive updates about the Art Center’s programs. Not Just Another Pretty Face is the Art Center’s matchmaking commissioning program for artists and potential art buyers, facilitating lasting relationships between artists and patrons, a new base of support for artists, and investment in the vitality of Chicago’s cultural community. To date, the Art Center has raised nearly $1 million—half of which goes directly into the hands of artists, with the other half going to support Art Center programs. Through Not Just Another Pretty Face, nearly 400 original works of art have been commissioned by nearly 300 new and established collectors interested in investing in Chicago’s artists. How Do I Make A Donation To Hyde Park Art Center? You can make a donation online here, send a check to us at 5020 S. Cornell Ave., Chicago, IL 60615, or call us with your payment information at 773-324-5520 ext. 1014. Thank you for your support! When is Hyde Park Art Center's Annual Gala? Hyde Park Art Center’s 2017 Gala is Saturday, October 14. More information is available here. Not Just Another Pretty Face is Hyde Park Art Center’s signature collaborative art commissioning project. To learn more, or to inquire about participating as an artist or patron for the 2018-2019 iteration, please email Maria Nelson at mnelson@hydeparkart.org. What Are The Benefits Of Donating To Hyde Park Art Center? Beyond directly supporting Chicago’s art and artists, Hyde Park Art Center offers a suite of recognition and benefits for different contribution levels. For example, members receive discounts on classes, and donors who contribute $1,000 or more annually qualify for exclusive benefits through Ruth’s Circle. What Opportunities Does Hyde Park Art Center Have To Support Specific Programs? We would be happy to discuss support for specific programs, including exhibitions, residencies, arts education, and the Art Center’s Oakman Clinton School & Studios. Learn more here or call us at 773-324-5520 ext. 1022.
Who Supports Hyde Park Art Center? Hyde Park Center thrives because of broad support from many different people. Thank you to all the donors, members, and volunteers who have been involved with the Art Center over the years. Because of you, we are looking ahead to a very bright and exciting future of supporting Chicago’s art and artists.